When it comes to fiction, I am forever buying books with teapots or teacups on the cover only to find out I am way off base with my selection. That was the case with "Tell the Wolves I'm Home" by Carol Rifka Brunt, which was not at all the happy-go-lucky book I expected. And yet I did enjoy this book about a young girl named June whose favorite uncle, an artist named Finn, has just died. 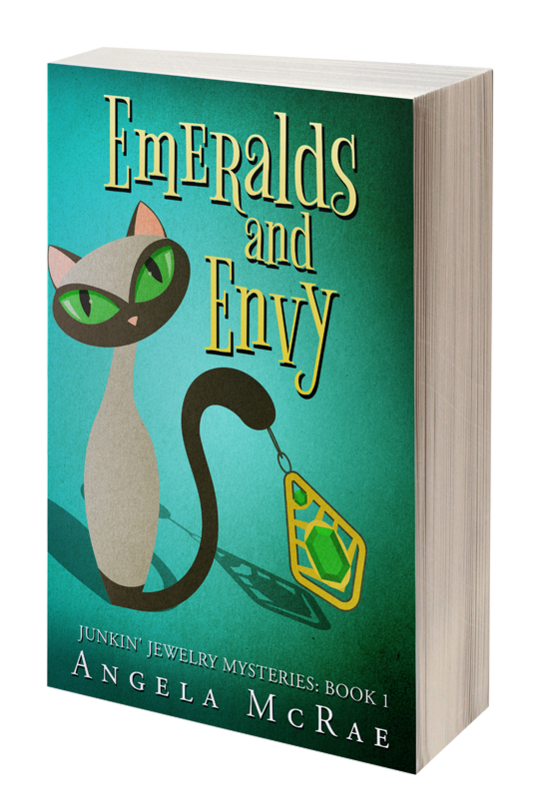 Here's the line from the back cover which lured me in: "... soon after Finn's funeral, June receives a surprise package in the mail. Inside is a beautiful Russian teapot she recognizes from Finn's apartment, along with a note from a stranger named Toby, asking June for a chance to meet." 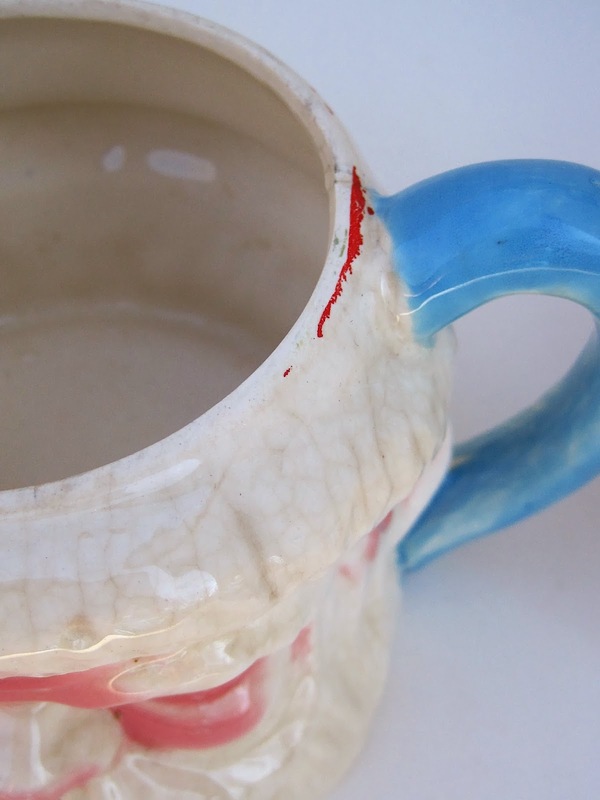 A book that hinges on a mysterious teapot? I'm in! 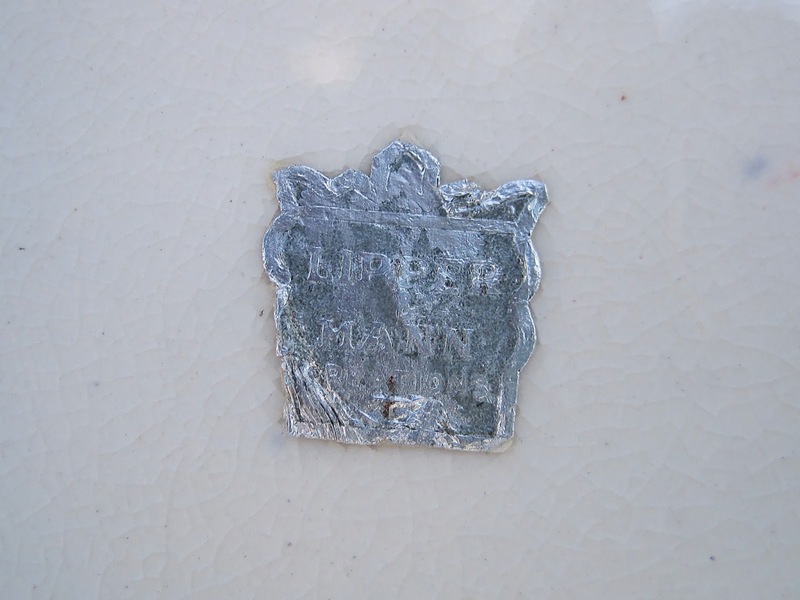 Now first it must be noted that the pot on the cover is not, in fact, the one described in the book. The mystery teapot is said to be "a magnificent Russian teapot" that was "gold and red and blue with little dancing bears etched around the sides." So there's that. The other surprise (and I don't believe I'm giving away too much here) is that June's beloved uncle died of AIDS. Well, I had a beloved uncle who died of AIDS, so that was another reason I was so interested in the book. June and her older sister Greta have a very competitive relationship, and that's intriguing to me as well. I am very blessed to have a wonderful younger sister (definitely couldn't have made it through this past year without her), and yet I hear of so many women who have sisters who are just a nightmare to get along with. I can't imagine that, never having experienced it, so it's always interesting to me to read about the family dynamics when siblings don't get along. I have tried to analyze why I liked this book, because I really shouldn't have: the uncle's death should have made me sad, the teapot artwork was misleading, and, oh yes, June mentions that she doesn't believe in God, which also made me very sad for her. And yet ... well, I loved June, and the book was just so beautifully written I found myself eager to see what happened after June got that teapot in the mail. The climax of the book was terrific, if utterly unbelievable, and yet it, too, was so well-written I didn't care about the believability factor. 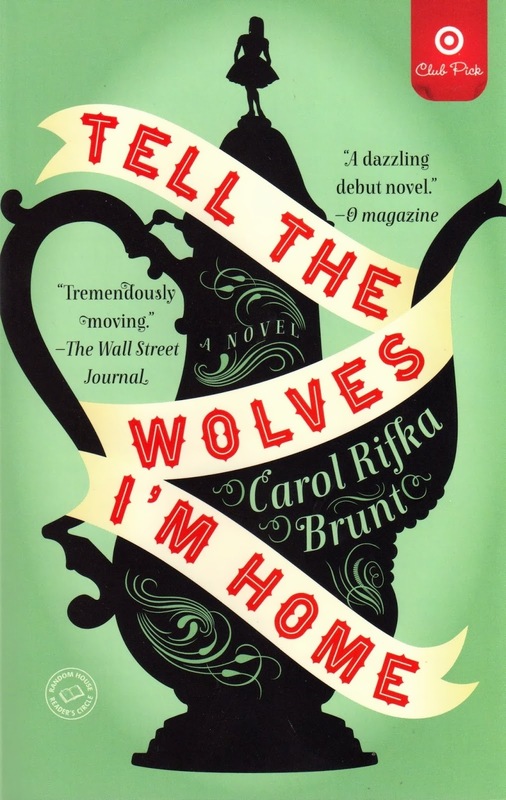 "Tell the Wolves I'm Home" is definitely not your usual fiction for the "tea party" crowd, but I do think some of you might enjoy it. If you've read this book, I'd love to hear your thoughts. In fact, if you've read anything good lately, I'd love to hear about it! 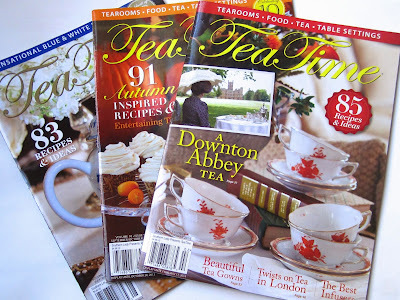 Esther T. wins the Tea Time magazine subscription! Congrats to Esther T. of the teafortoon blog, winner of the Tea Time magazine subscription. 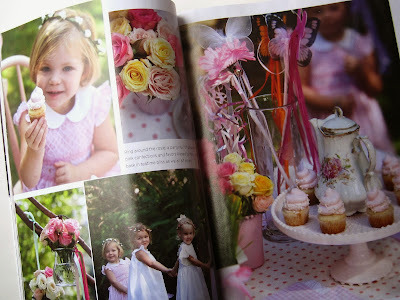 If you'll send me your snail mail address via the e-mail button at right, I'll get your info sent off to the magazine! 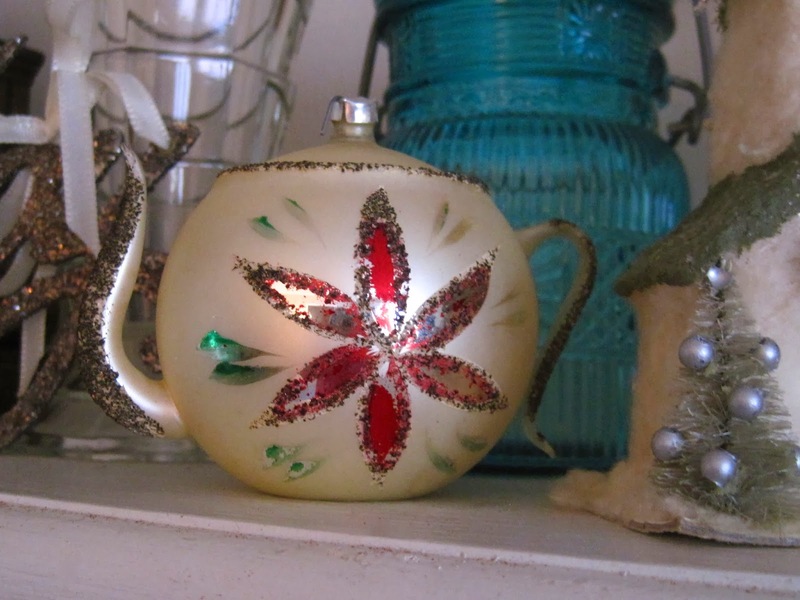 One of the things I enjoy seeing on tea blogs at this time of year is all the neat tea-related gifts everyone has received, so I thought I'd share some of mine today! 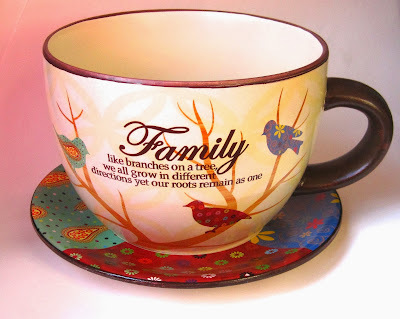 First, from my sister Rhonda's family came one of the cutest porcelain tea mugs I've ever seen, this I (Heart) Tea mug. Love it! 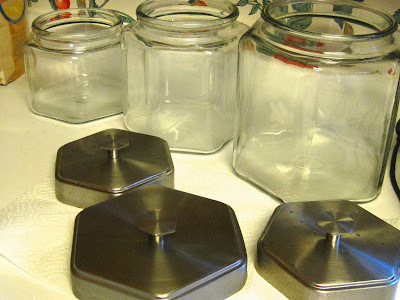 Rhonda also was responsible for Daddy purchasing some much-needed glass canisters for my kitchen (I've just rinsed them out here), so thanks, sis! I was so tired of reaching into a canister for flour or sugar and realizing I was almost out, so clear glass should solve that! From my stepdaughter Heather's family came a Wedgwood ornament like this one (she had looked on my blog and apologized for it being a duplicate, but I told her I will take all the Wedgwood teapot ornaments I can get!). 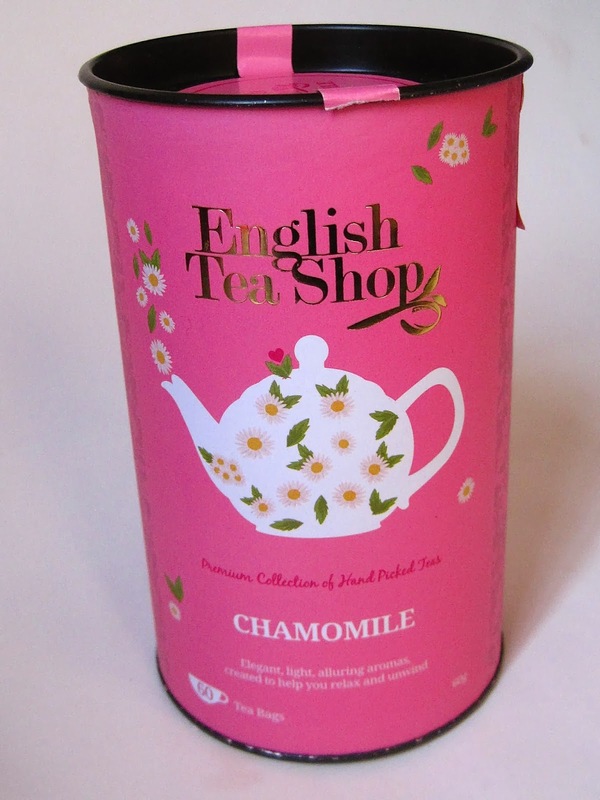 They also gave me some new Chamomile Tea from the English Tea Shop. 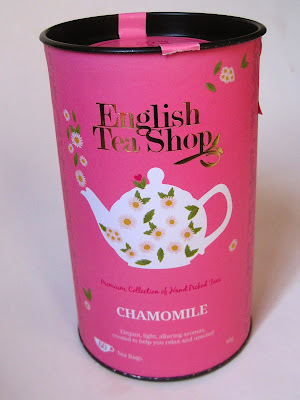 I haven't had Chamomile in a while and very much enjoyed it! From my stepson Hunter's family came this lovely (and oh, so appropriate) teacup planter. It's the first large teacup planter I've seen to come with a saucer. 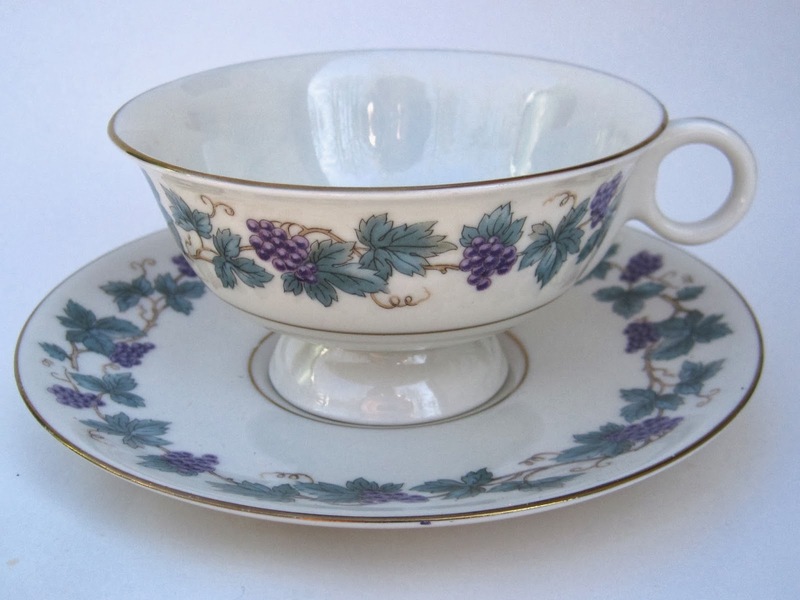 ... who also gave me a second set this year, a grape design teacup! 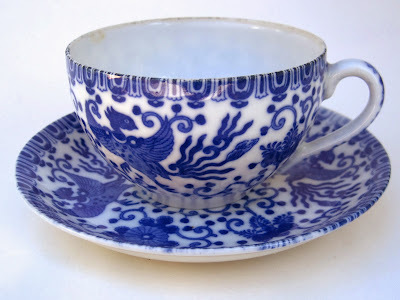 With a nod to my current blue obsession, my friend Sandra gave me this great blue and white teacup and saucer made in Occupied Japan. Pretty! And finally, my friend Deberah gave me some White Tea & Ginger goodies from Bath and Body Works. Fun stuff, all! I also got some cute new tea infusers (from my husband and from Deberah), but I'm waiting to try them out before I share them here. 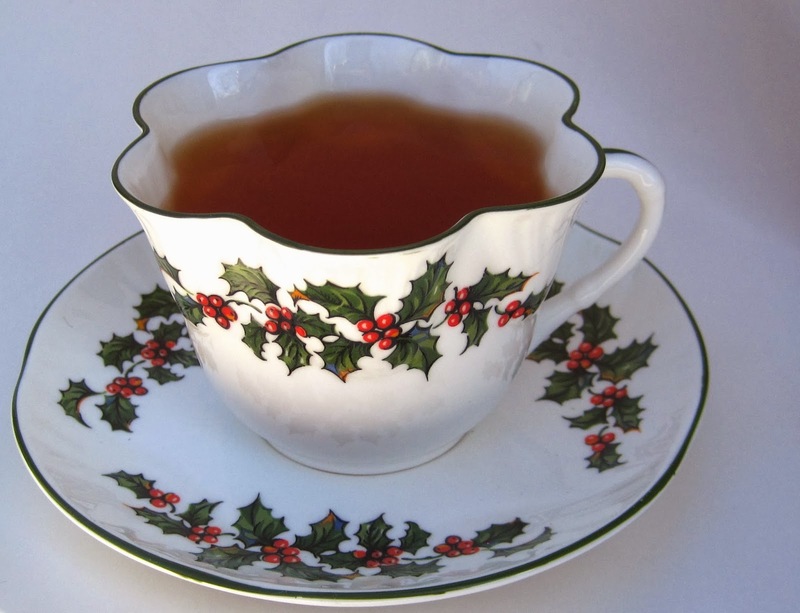 Did you get any nice tea goodies for Christmas? I know what you're thinking: "I didn't eat enough sweets over Christmas, and wow, I sure do wish someone would share just ONE MORE rich, sugary dessert for me to make!" Well, friends, here you go, a deliciously rich new treat, Cranberry Raisin Bars. As I end this year of trying tea room cookbook recipes, it's nice that the 1996 cookbook I used, "In Chelsea's Kitchen," is from a tea room I actually visited before it closed earlier this year, Chelsea's in Asheville, N.C. 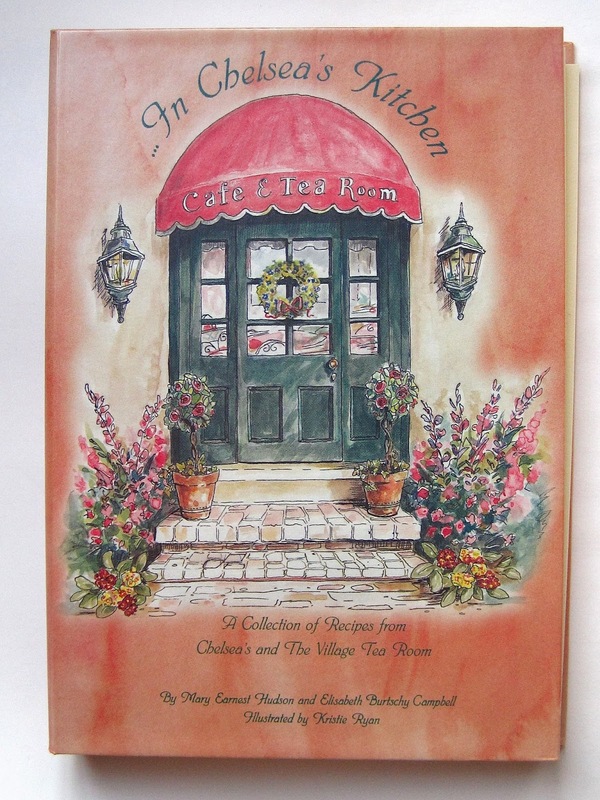 I visited Chelsea's once with my husband several years back, and once with some tea blogger friends in 2012. Both times I just loved Chelsea's, and I was sorry to hear it closed but happy I have a book of their recipes to enjoy! It'll be Salad City around here in another week or so, but until then I'm still in holiday baking mode and thought these bar treats sounded particularly scrumptious. 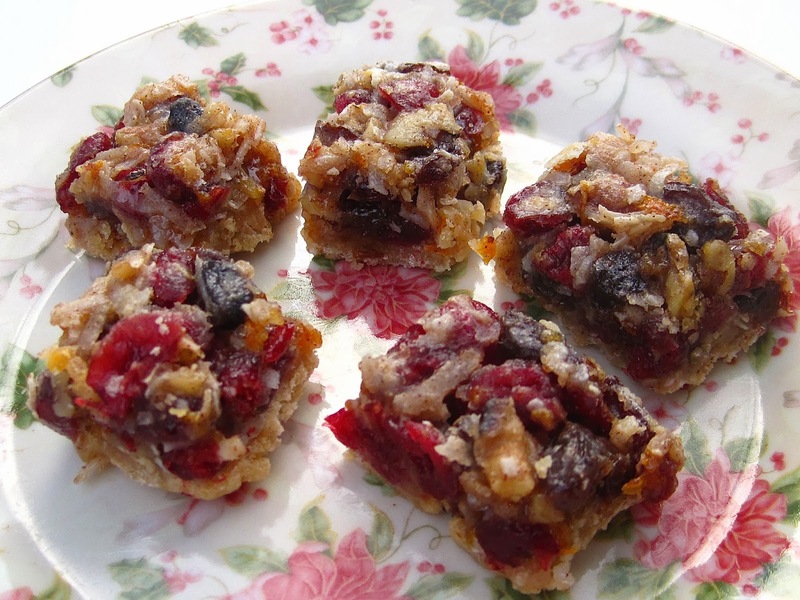 They came from the cookbook's "Afternoon Tea" chapter, and indeed I thought my Cranberry Raisin Bars were simply perfect enjoyed (in small portions) with tea! Preheat oven to 350 degrees. Cream butter, then add the brown sugar and 1/2 cup of flour. 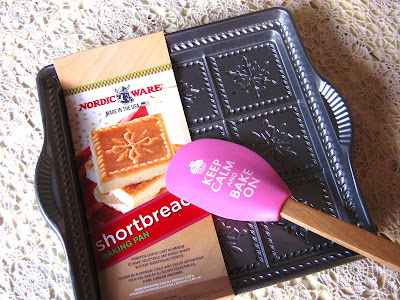 Combine with a pastry blender until you have a soft dough, then pat it into the bottom of an 8-inch-square baking pan prepared with cooking spray. Bake for 5 minutes. 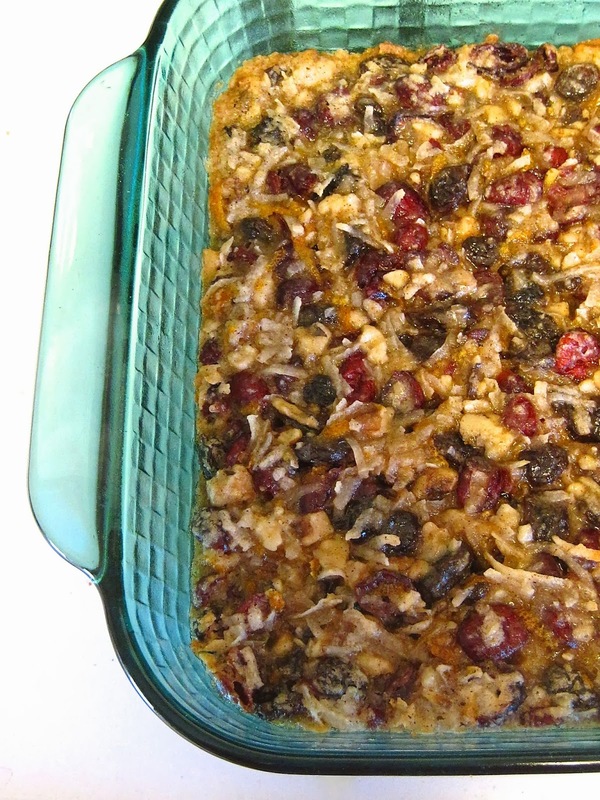 While crust bakes, combine remaining 2 tablespoons of flour with other ingredients. When crust has finished baking, top with mixture, then bake for 25 minutes more, or until edges are beginning to brown. Cool completely before slicing. 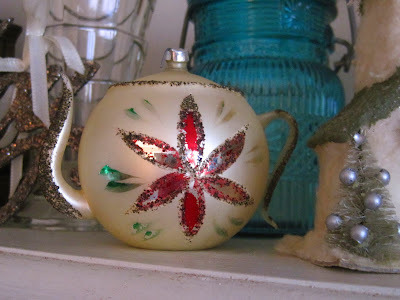 ***Be sure to stop by next Saturday if you'd like to see what my 2014 "Tea Project" is! All winter long I enjoy mint-flavored teas, so I picked up this tiny tin of loose-leaf Organic Mint Melange Mighty Leaf Tea at T.J. Maxx while out Christmas shopping one day. This looked like the sort of thing that might have once been part of a gift set, and I wondered how such a small tin (only as tall as a teacup) ended up for sale at the store. 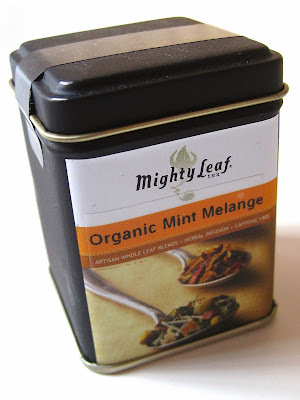 But I must tell you that the whole time I've had this tin, I've read it as "Orange" Mint Melange, not "Organic" Mint Melange. When I first tried the tea, I thought, "Hmmm, I'm not tasting any orange here." Do you ever misread anything like this? 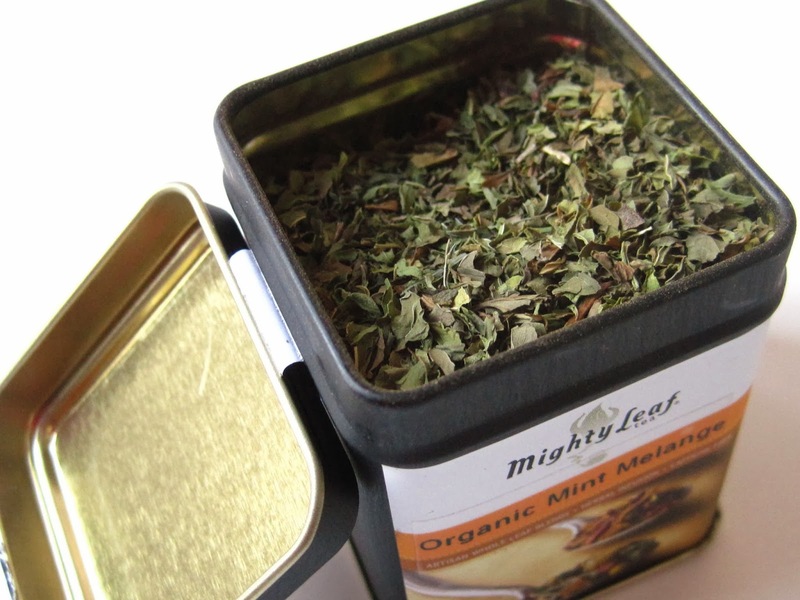 At any rate, I enjoyed the nice minty smell when I opened the tin, and my *Organic* Mint Melange herbal tea was quite lovely, a perfect accompaniment to an afternoon sweet! 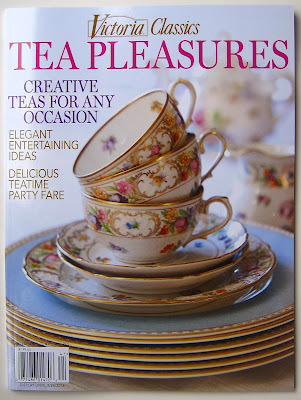 Since right now is one of the best times of the year to settle in for a quiet night of reading a new book or magazine, I wanted to mention that the Victoria Classics line of special issues has just come out with a new tea-themed publication, Tea Pleasures, which I picked up at Barnes & Noble right before Christmas. 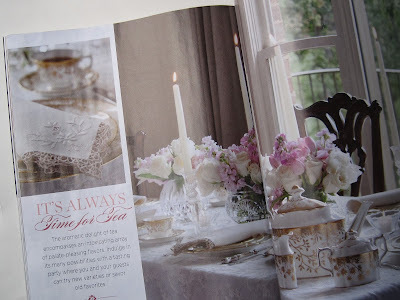 There are features on all sorts of "Occasions for Tea," including a Book Club Tea, a tea for stitchers, a bridal tea (a dear friend's daughter just got engaged ... hmmm! ), and the sweet birthday tea shown here. The elegant gold and white color palette here was used for a "tasting party" where friends can try tea flavors old and new, an idea I think is quite lovely for celebrating National Hot Tea Month in January. 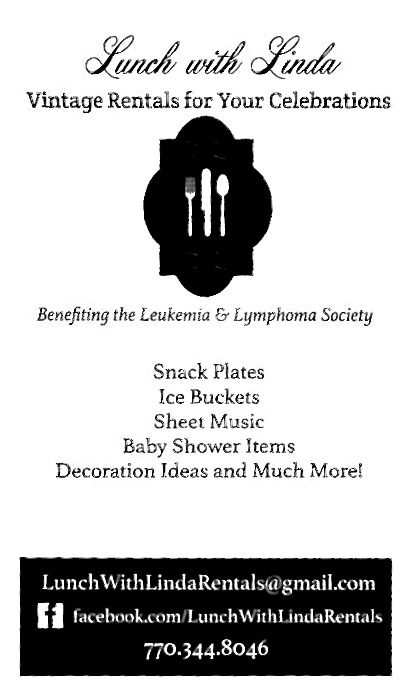 If you haven't seen this issue yet, you may want to take a look! 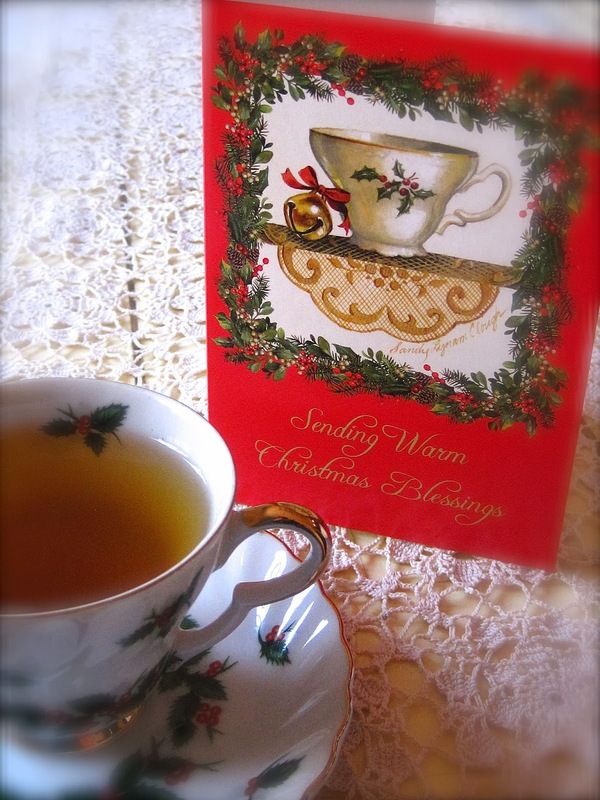 To all my dear tea friends, I wish you a very Merry Christmas! 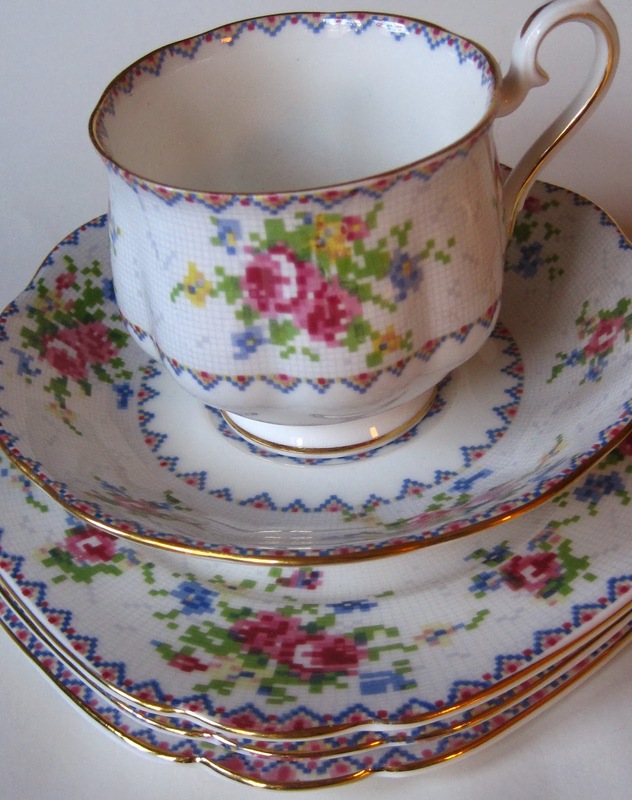 Tea Sets, Toyland & Trivia! It's been on my bookshelf for several years now, but I just got around to actually reading "Under the Tree: The Toys and Treats That Made Christmas Special, 1930-1970," a 2007 book by Susan Waggoner. 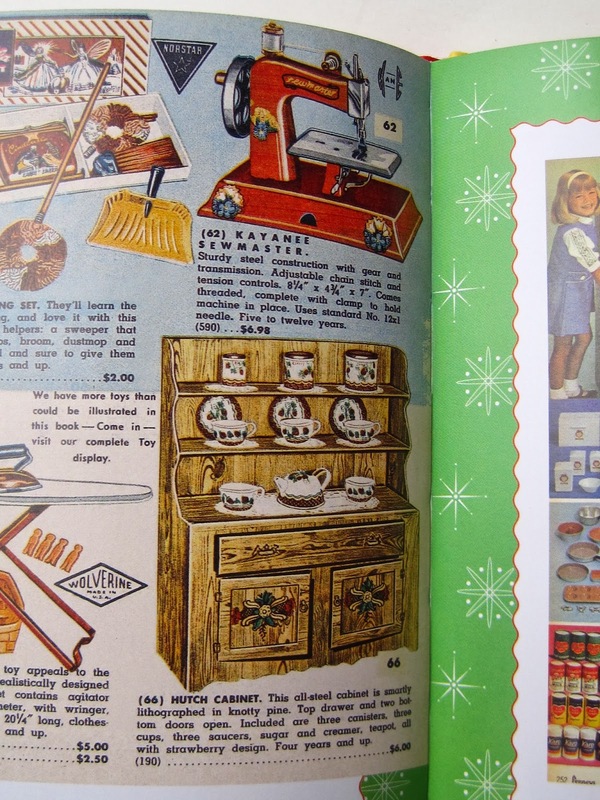 You don't *have* to be a fellow Baby Boomer to enjoy looking at all the fun photos and reading the fascinating history and trivia about toys, but it sure helps! 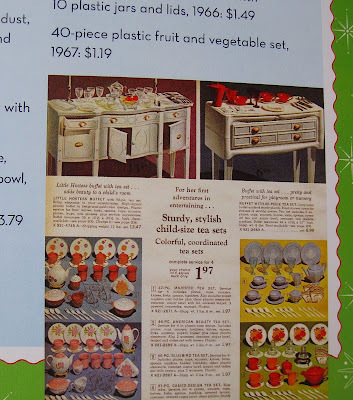 "Under the Tree" also talks about the popularity of homemaking toys, and I remember having a number of kid-sized furniture pieces. In fact, I felt a little guilty reading this book as I realized what an indulged child I was! 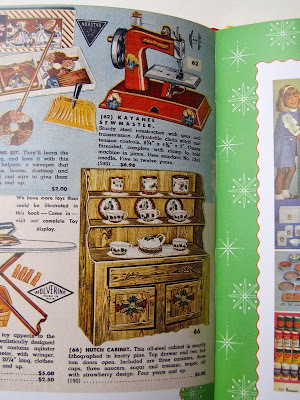 The ads for such pieces are so fun to read today, like this little steel hutch, made to look like wood, that came complete with teapot and dishes ($6 for all in 1954). • What really made the Madame Alexander doll company a household name was the creation of the Dionne Quintuplet dolls after the birth of the quints in 1934. And "Madame" Alexander's real name was Bertha. 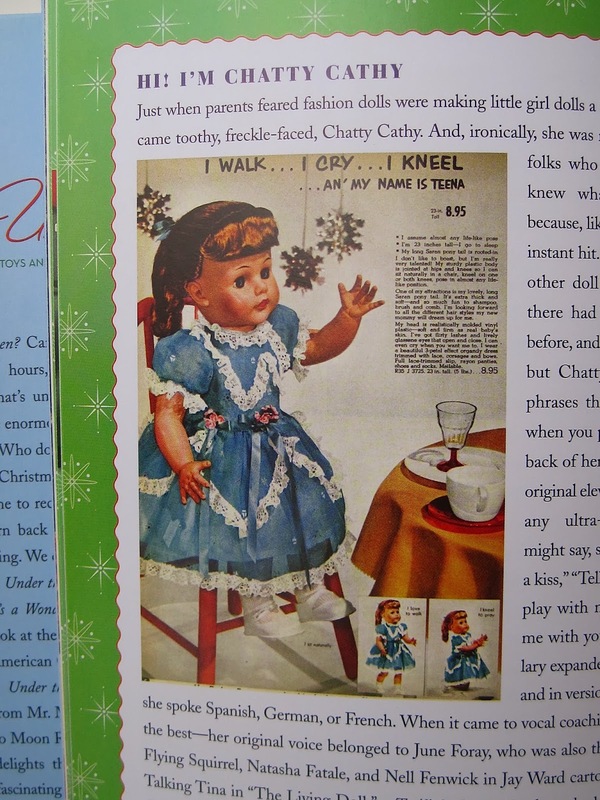 "Mommy, may I please have a Bertha Alexander doll for Christmas?" Just doesn't have the same ring to it, does it? • In the early 1900s, a woman named Elizabeth Magie created the Landlord Game, which "was supposed to demonstrate the ills caused by unequal distribution of wealth." To her dismay, the players not only didn't learn to have compassion for poor people, but instead they loved winning big piles of money and enjoyed watching the other players fall into bankruptcy. No one wanted to manufacture the game — until 30 years later, the game came out with a new name, Monopoly, and became a hit toy during the Depression. Who knew! 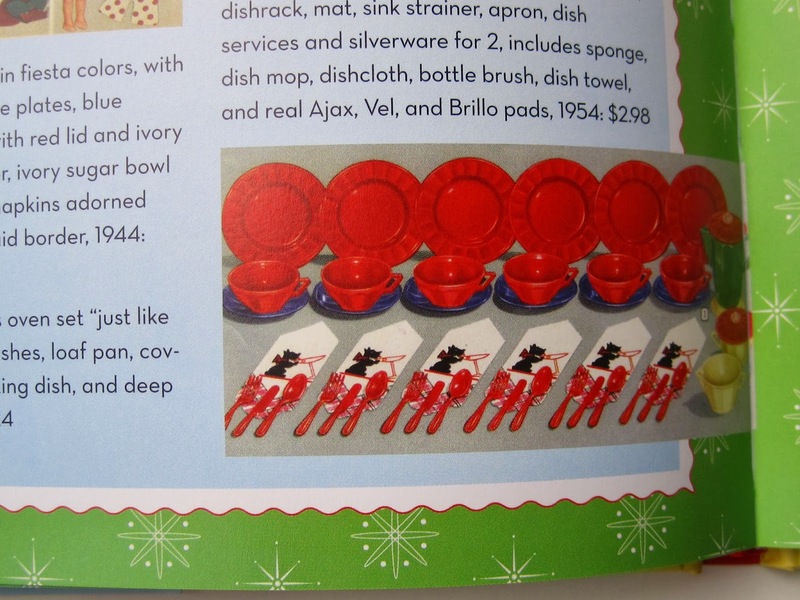 Finally, I thought I'd share one more detail from the book, which I first noticed because of the great variety of tea sets at the bottom, but then I zeroed in on the Little Hostess buffet at top left and went in search of an old family photo. 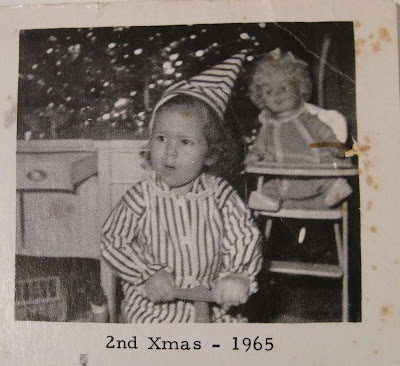 Yes, I apparently got that Little Hostess buffet myself for my second Christmas in 1965 (the same year my parents decided for some reason to dress me in a striped dunce hat), and I would not be surprised if I got a tea set to go with it as well. 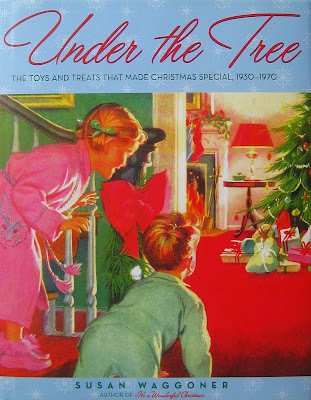 "Under the Tree" was quite a fun trip down memory lane, and some of you might enjoy reading it as well. 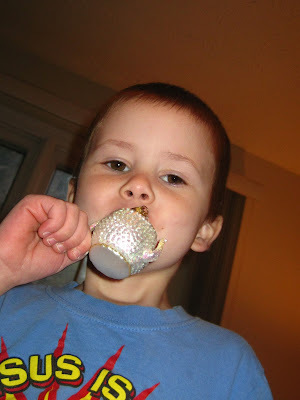 If you have a memory of a favorite toy, I'd love to hear about it! 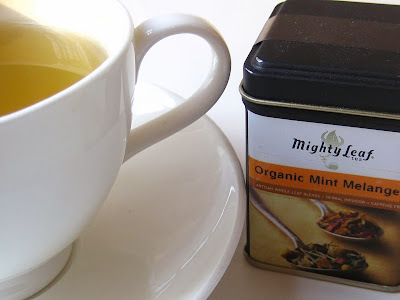 A Tea Time subscription giveaway! My favorite thing about Christmas is giving gifts, and I found a super easy way to give one here this week as well. You see, my Tea Time magazine subscription is up for renewal, and I just received an offer in the mail saying that for just a few pennies more, I can give a friend a new Tea Time subscription as well. So, would you like to be my friend? I just received the January/February 2014 issue in the mail last week, and it is just as lovely as always. Those of you who watch "Downton Abbey" (can you believe I still have not?) 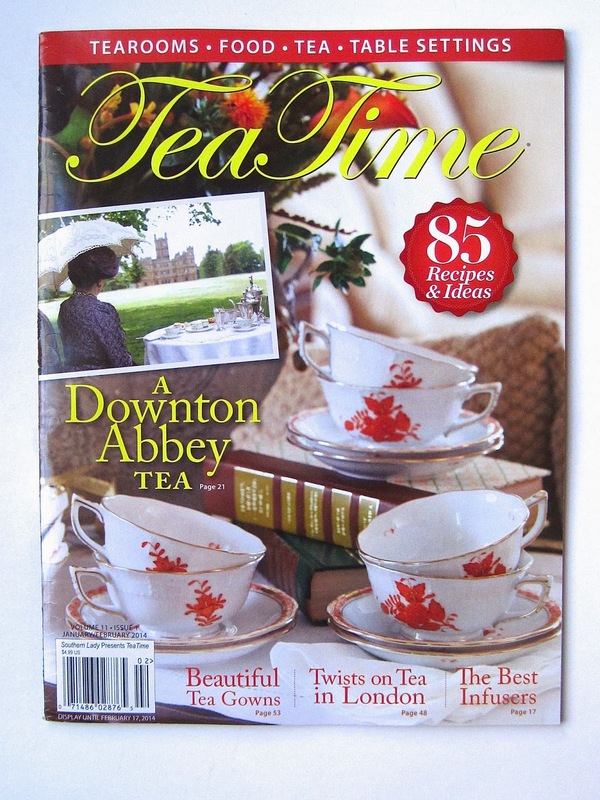 will love the feature on a Downton Abbey Tea, and there are also features on tea gowns, tea places in London, and the usual entertaining tea columns. If you don't have a subscription (because it has to be a new subscription, apparently) and live here in the U.S., please leave an "enter me" between now and 7 a.m. EST next Monday, Dec. 30, and you'll be entered to win. Good luck! 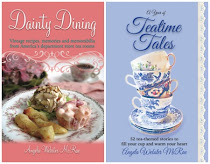 One thing I have learned by cooking from tea room cookbooks this year is that a tremendous variety of foods is offered in tea rooms! 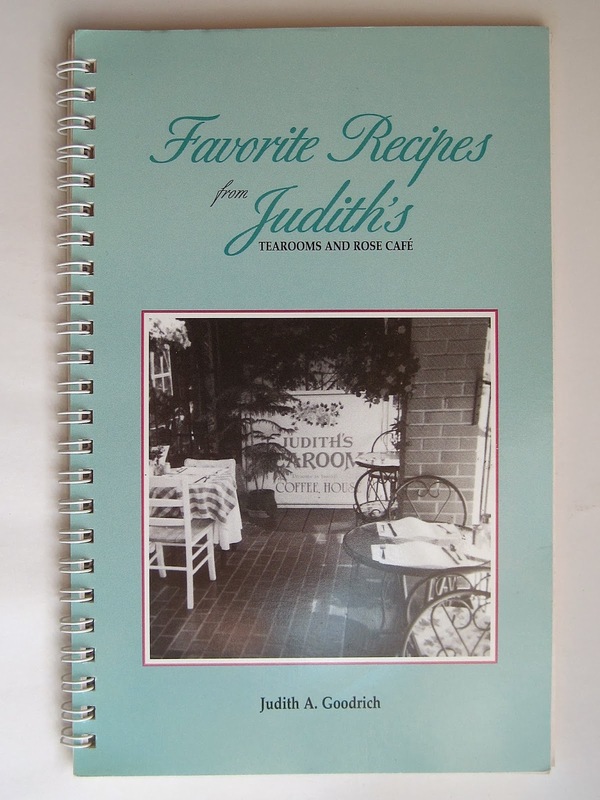 From dainty sandwiches and salads to hearty comfort foods, there is truly something for everyone to be found within the pages of a tea room cookbook. This week, I decided to make a nice, hearty soup. 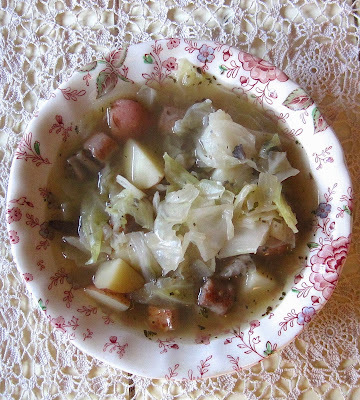 This soup is inspired by the Black Forest Cabbage Soup in the 1996 cookbook "Favorite Recipes from Judith's Tearooms and Rose Café." I say "inspired" because this Poulsbo, Washington tea room obviously made everything from scratch, and I just didn't have time for that this week. So I cheated. Don't judge me. It was still just delicious! Basically, the "authentic" version calls for homemade meatballs and homemade chicken broth, but I used store-bought versions of both. The result was still just amazing, which is a good thing because I have been eating from this huge pot of soup all week long! 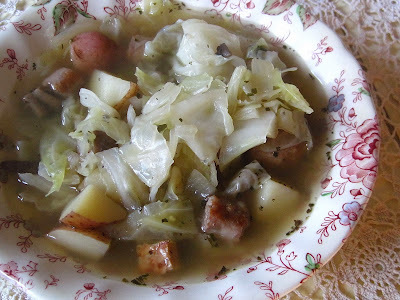 Toss chopped cabbage in bottom of a large stockpot. Add remaining ingredients and bring to a boil. 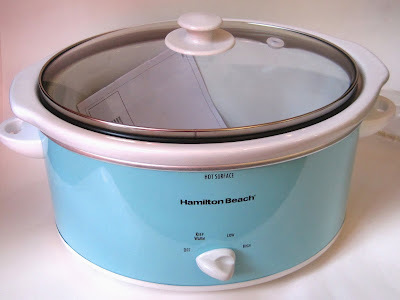 Reduce heat, cover and let simmer for about 30 minutes. Terrific served with sourdough bread. Makes about 16-20 large servings, I'd say! 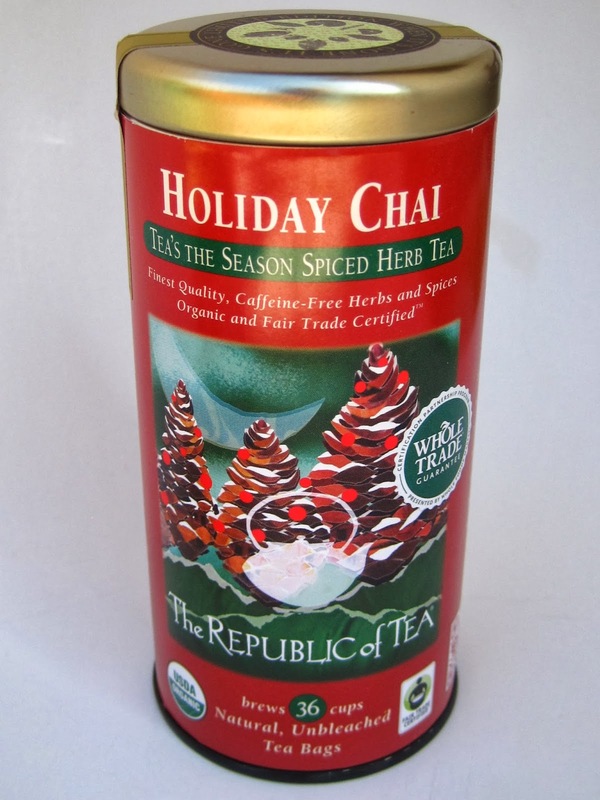 Recently at Whole Foods I came across this Republic of Tea Holiday Chai. 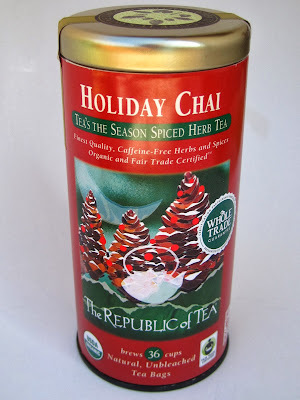 I thought I'd tried all of the ROT holiday teas, but this one was new to me, and after looking online I believe it may be exclusive to Whole Foods, so that's why I haven't seen it before. This rich-tasting rooibos tea is flavored with lots of Christmasy spices, including ginger, cardamom, black pepper and cloves. 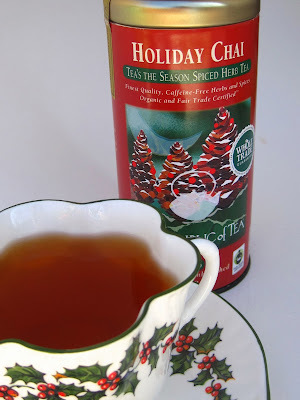 It's a very different taste from the cinnamon-flavored spice teas I usually find at this time of year, although I like those too! My teacup, by Crown Staffordshire in England, is a favorite Christmas teacup because of its scalloped design, but one day I was sipping without looking at the cup and suddenly realized you really *must* pay attention to those scallops or you'll dribble tea all over yourself! I always love it when a new copy of the free Upton Tea Quarterly arrives in my mailbox. This issue features part 30 (!) 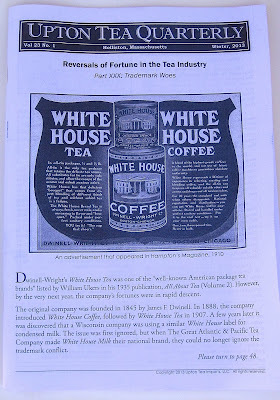 of their ongoing series "Reversals of Fortune in the Tea Industry," and there's a nice essay about the White House Coffee and Tea brands. 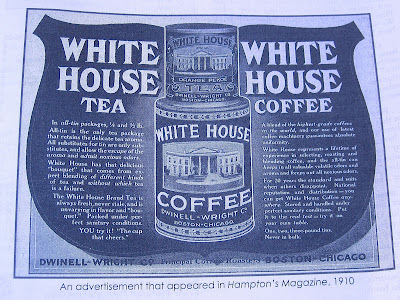 I was especially interested in this topic because I featured a White House Coffee and Tea pamphlet on the First Ladies earlier this year (go here to see its images of the First Ladies' coffee and tea cups). 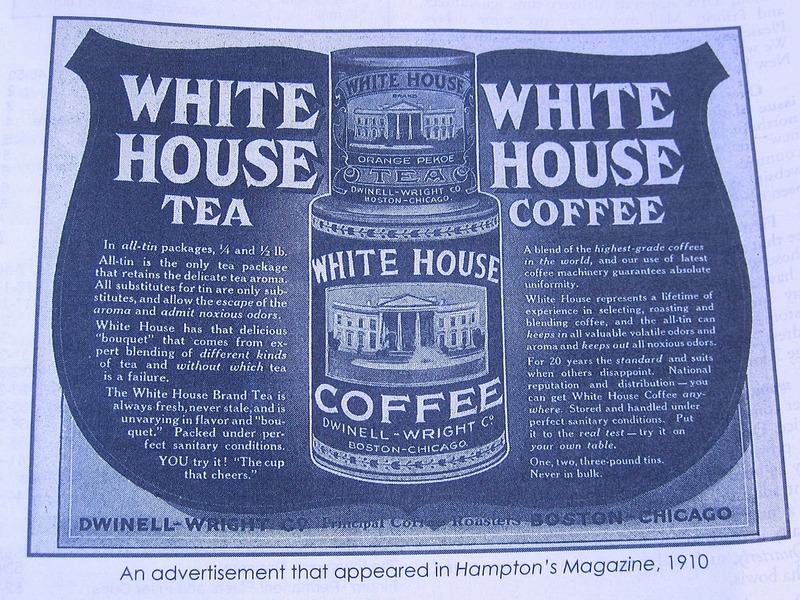 What I learned from this article is that White House Coffee and Tea did not actively protect their brand's trademark after A&P made a "White House Milk" their own national brand, using a similar label design. 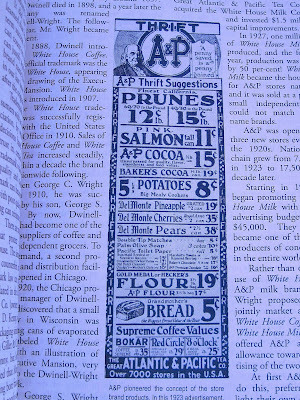 I love reading old grocery ads such as this one for A&P in 1923. 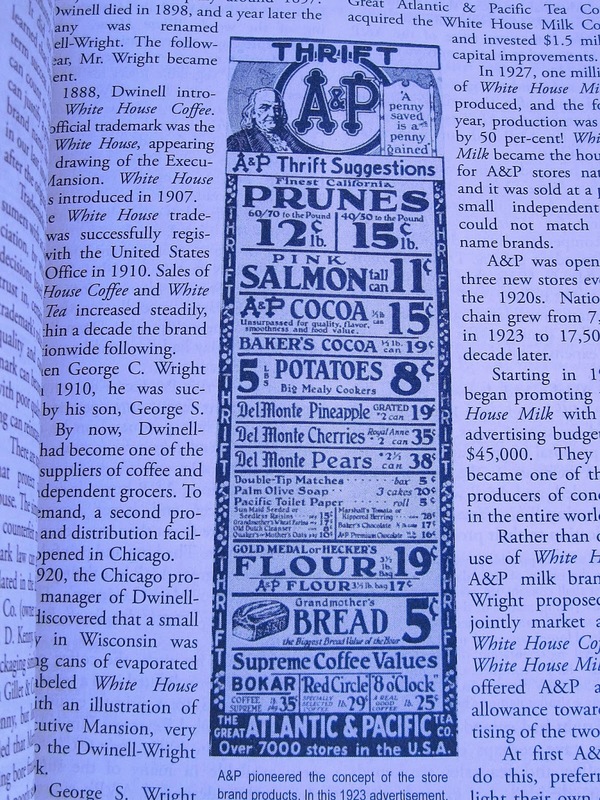 Wouldn't you love to purchase a can of salmon for 11 cents or a can of cocoa for 19 cents? I would! 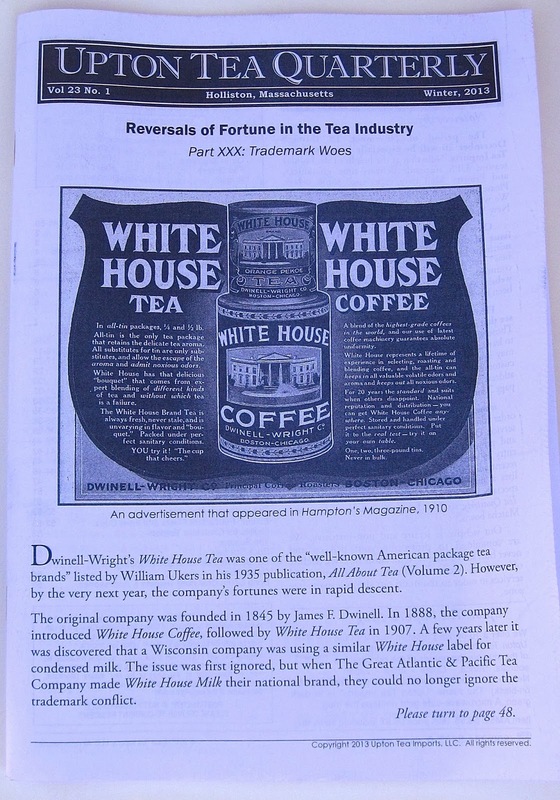 Oh, and one other bit of trivia for the tea history lovers among us: "In 1883, Congress passed their first consumer protection bill, the United States Tea Adulteration Act, which required that all imported teas be held in bond until an expert could evaluate the integrity of the product." 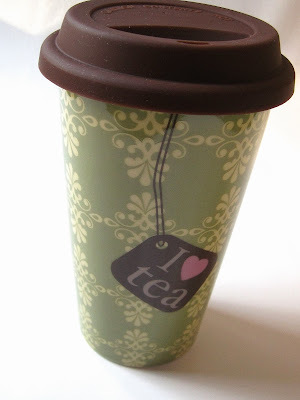 Somehow, I feel a little smug knowing the first consumer protection bill was about ... tea! You can read the article yourself (or get on the mailing list) by going here. Several years ago, I wrote about having found a new Royal Albert Petit Point cup and saucer (shown here) at a bargain price. It's probably the most accidentally interesting blog post I've ever written, simply because I have received lots of e-mails from people scouring the internet who wanted to sell me some of their Petit Point dishes. Now, you can learn a lot about human nature by studying such e-mails. As most of you know, I'm pretty cheap when it comes to my "collecting" (far too formal a term for my little junkin' habit). So when people offer to sell me entire sets of dishes, I write them back politely and say thanks, but I'm not really a serious collector of this pattern. Sometimes, too, I've gotten rather snippy e-mails letting me know that if I didn't go to some website immediately and pony up rather large amounts for their Petit Point wares, I was going to lose out on the opportunity of a lifetime. I didn't acknowledge those sorts of e-mails, though I can assure you I was tempted to! Most people, though, have been exceedingly nice, and some were almost apologetic about even e-mailing me. A kind inquiry is never in bad taste, so I have never minded those polite inquiries. 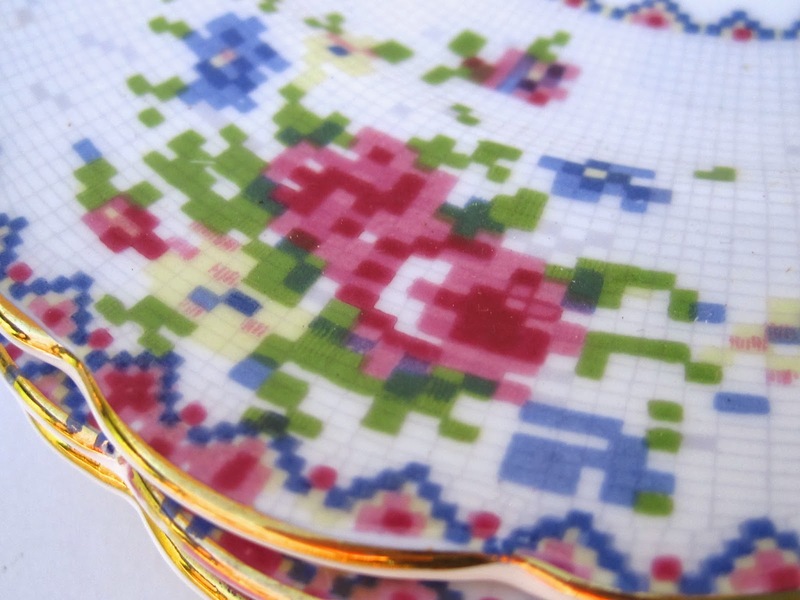 But the *best* such e-mail came recently from a woman in Alabama, a small business owner, who happened to buy some items that included three Petit Point bread and butter plates. When she searched online for more info, she came across my old blog post. This time, she wasn't trying to sell me anything. 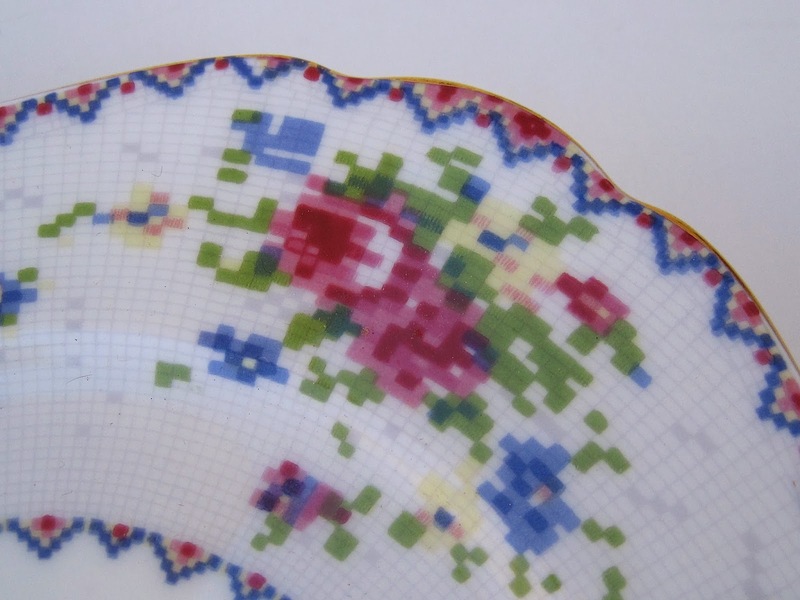 She just wanted the plates to have a happy home, and she said if I'd pay for postage she'd send them to me for free. Now isn't that amazing? I love the new plates (they make me want to go cross-stitch the design), but mostly I love knowing how they came into my possession. And now it's inspired me to "pay it forward," so hopefully soon I'll be able to do something kind for a complete stranger, simply for the pleasure of being nice! 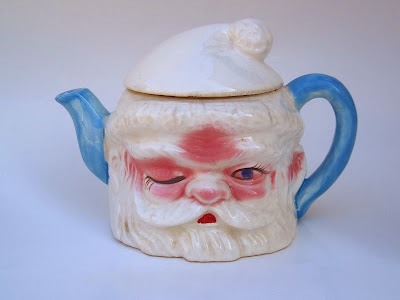 For years now I have collected Santa Claus mugs, and while I've seen plenty of large Santa Claus pitchers over the years, I've never seen a vintage Santa Claus teapot until Saturday. I found this teapot, with a matching sugar and creamer, at a new (to me) antique mall in Carrollton. As soon as I picked up the crackledy, crazed teapot I knew I wanted it, but the set had no price. I always hesitate to ask about unmarked items, figuring the price will instantly go up. 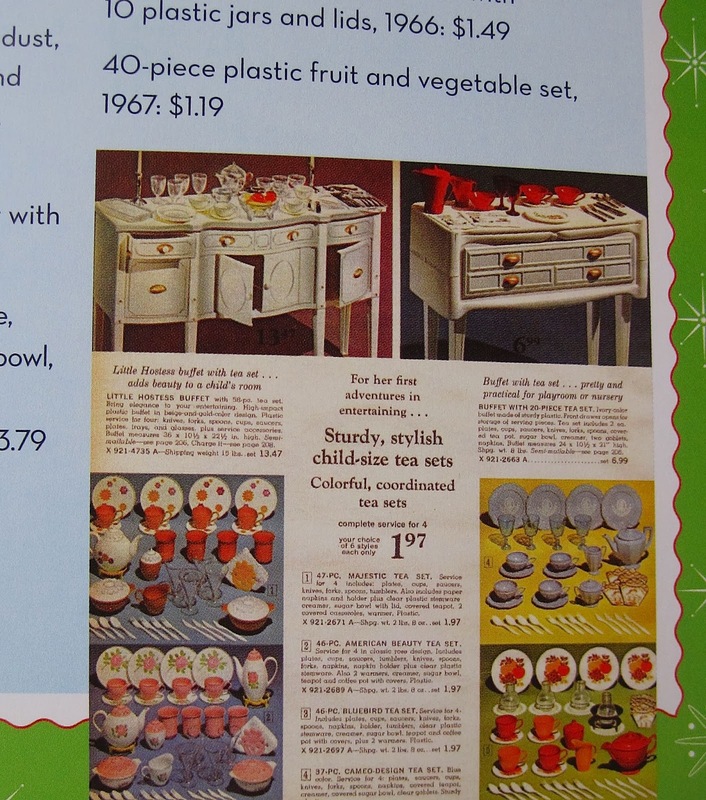 "Play it cool" is my motto, so I asked the nice lady, "Do you happen to know the price on this Santa set?" She paused for a moment. "How about … five dollars?" "Sold!" I said, perhaps a bit too enthusiastically. 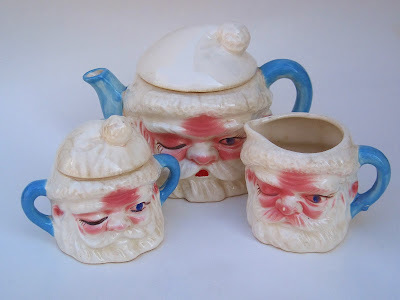 I was very sorry to learn the antique mall is closing this week since I had just discovered it, but at least I found a treasured set for my collection of Santa mugs and associated pieces. 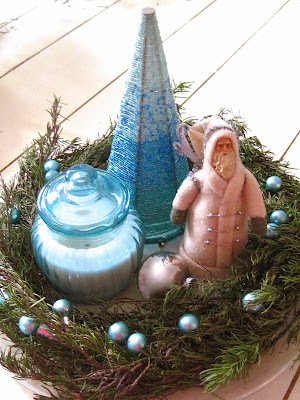 I didn't decorate with them this year because they are mainly red and white and I am decorating with pale blue this year, but who knew I would find a set that would be suitable for both color palettes! I was also happy to find original stickers on this set. The ones on the sugar and creamer are too faded to read, but the silver sticker on the teapot had just enough letters for me to figure out it said "Lipper and Mann Creations," which was a New York firm that started importing ceramics back in the forties. Interestingly, I found the same set on eBay (for $45), only it had the traditional red hat instead of being all white with blue accents. 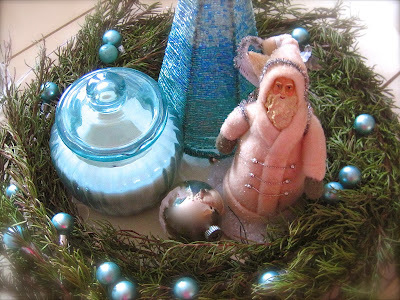 But when I removed Santa's white hat, guess what? I see my set was originally red as well, though I must say I like it even better as it is today! 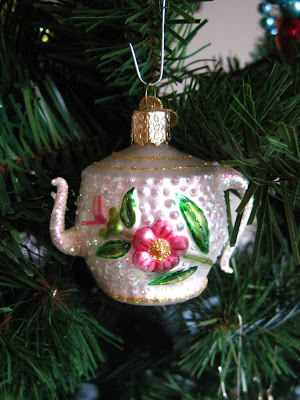 Recently I shared photos of my tabletop tea-themed Christmas tree, but I have used teapot ornaments elsewhere in my Christmas decorating as well! On the mantel this year I'm using three vintage glass teapot ornaments I found on eBay a few years back. ... 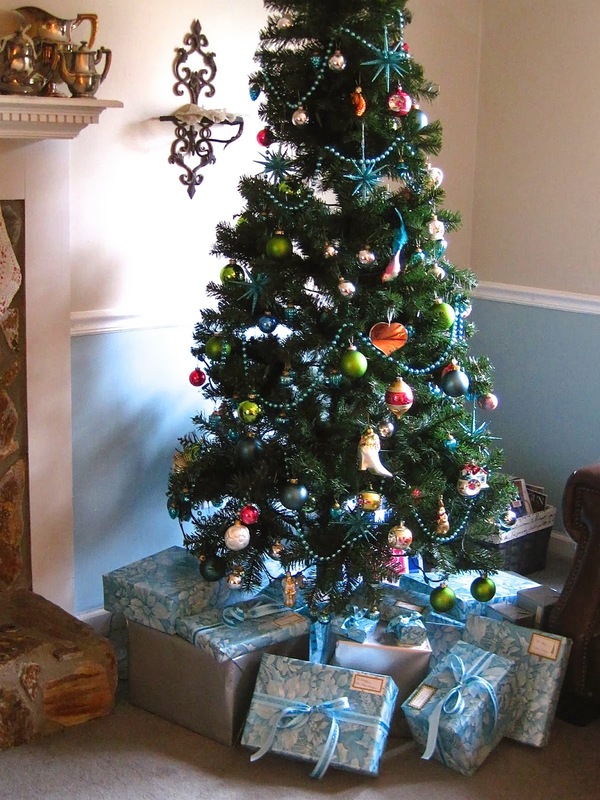 I was very, very happy when they turned up this year in a box of "winter white" decorations. I vaguely recall having left these out after Christmas, so that's how they got separated from all the others. They are so sparkly and frosty looking, and I just love them! 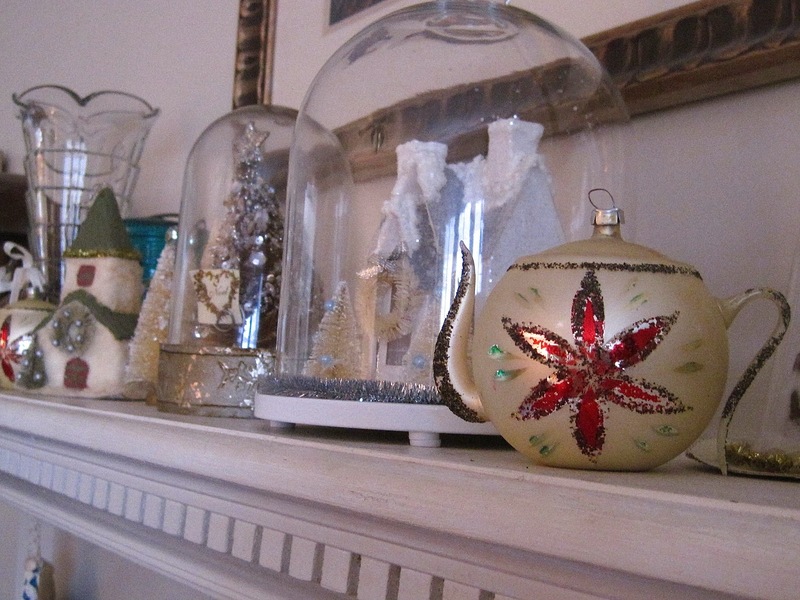 And since I so enjoy reading about all of *your* Christmas decorations, I thought I'd share a few more of mine! 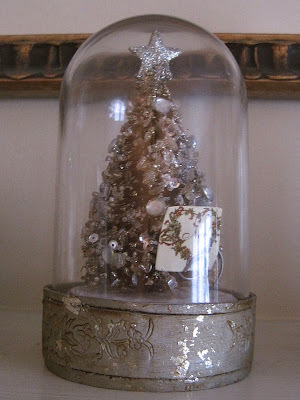 I just love glass domes on anything at Christmas, and this little glass-domed tree is very special to me because I found it at the Rachel Ashwell Shabby Chic store in Atlanta several years ago. 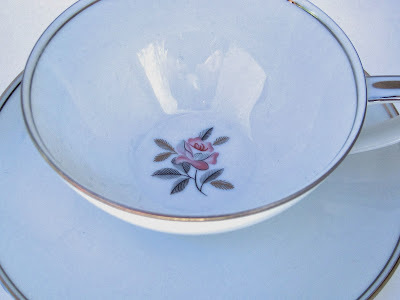 The store didn't last very long, but my love for Shabby Chic sure did! 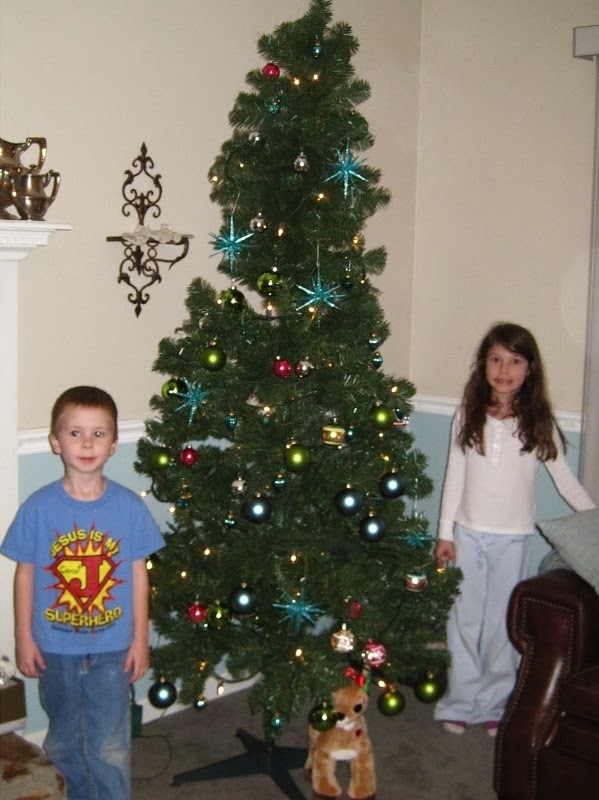 My helpers in decorating this year were nephew Matthew and niece Amelia, who spent the night with us on Thanksgiving Eve and decorated both the large and small trees. 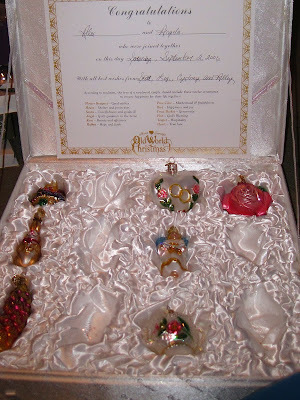 Some of these ornaments were already on the tree by this point, but I have always loved these Old World Christmas ornaments that were a wedding gift. 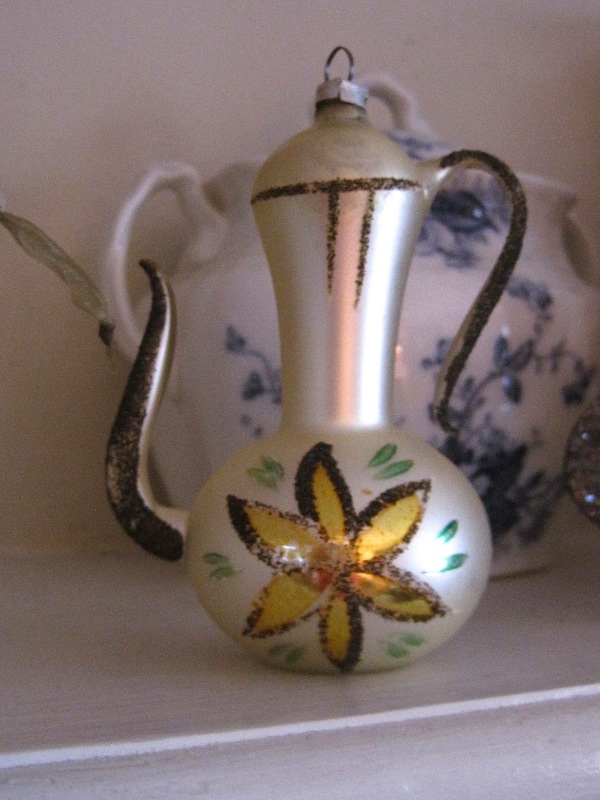 Each one represents a happy aspect of the home. The teapot, for instance, represents Hospitality. Matthew, who is all boy, pretended to drink out of it! One of the most fun parts of decorating is scouting out just the right wrapping paper, because it really does influence the look of the tree. The aqua blue poinsettia gift wrap came from Hallmark. The sparkly ribbon was on clearance at Michaels last year, but I ended up not decorating with blue until this year. Last month our Crossroads Garden Club had a presentation on Christmas greenery, and I was the happy winner of my friend Wilma's gorgeous rosemary wreath she created for the program. I plopped a few aqua goodies inside, and I love the result — plus it smells so yummy when I walk by! 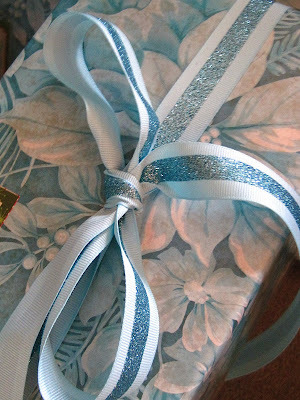 And if you'll come by tomorrow, I'll show you one more "something blue" I found over the weekend that is quite the perfect addition to another collection I sometimes have out at Christmas. Anyone want to take a guess on the collectibles I've decorated with before but let have a rest this year because of their bright colors? Amelia's fun American Girl teatime menu! Amelia & I visit the American Girl doll store! A giveaway for Giving Tuesday! My best (dish) buy of the season -- so far!